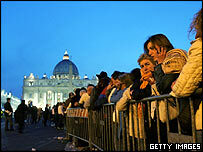 Crowds have been waiting all night at St Peter's Basilica to file past the body of Pope John Paul II before Friday's funeral. Pilgrims and tourists alike waited to get a last glimpse of one of the longest-reigning leaders of the Roman Catholic Church, who died on Saturday. Some waited eight hours to view his body. Many local people came early on Tuesday on their way to work. His funeral will see one of the biggest gatherings of world leaders in history. Church leaders and Vatican staff had their chance to pay respects over two days as his body lay on display in the ornate Clementine Hall. Late on Monday afternoon, the Pope's body was carried in a solemn procession to the basilica, where it will eventually be consigned to the crypt on Friday. It had been planned to close St Peter's for three hours each night to allow for cleaning. But in the event, the basilica stayed open until 0300 (0100GMT) on Tuesday, and reopened barely an hour and a half later for the public to be readmitted. The wait was so long that some elderly people fainted, while younger people sang to pass the time. When they entered the basilica, some mourners took pictures of the Pope's body with their mobile phone cameras. "All my life he has been with me in my darkest moments," Marcella Sogos, 36, told Reuters news agency, having flown in from Sardinia. "I would wait forever to see him... I didn't want to miss it, just like I wouldn't want to miss my own father's funeral." Sister Simone, a nun from Austria, shrugged off the long wait to enter the basilica. "He sacrificed his whole life for the Church, so a few hours mean nothing," she said. Some 200 foreign leaders, including US President George W Bush, will attend the funeral, while Rome is expecting up to 2m mourners to turn out. Travel agents in fiercely Catholic Poland, the Pope's land of birth, are struggling to meet demand for transport to Italy. Accommodation in the Italian capital appears to be the main problem with hotels and guest houses already full and work under way to erect makeshift shelters at sports grounds. Cardinals will deal with the day-to-day running of the Church until they elect a new pope at a conclave later in the month. Nearly 200 cardinals are involved in the consultations but only 117 of them are under the age of 80 and therefore entitled to a vote. On Monday, 65 cardinals met in Rome for about two and a half hours and set the funeral for 1000 (0800 GMT) on Friday. 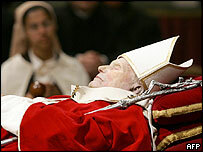 John Paul II died after suffering from heart and kidney problems and unstable blood pressure. 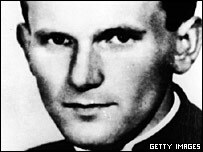 Born Karol Wojtyla, he became Pope in 1978, taking a conservative stand on issues like contraception and "liberation theology". He was the most widely travelled pontiff and visited more than 120 countries during his 26-year papacy.